The pIRkey adds an IR remote receiver to any computer, laptop, tablet...any computer or device with a USB port that can use a keyboard. This little board slides into any USB A port, and shows up as an every-day USB keyboard. The onboard ATSAMD21 microcontroller listens for IR remote signals and converts them to keypresses, mouse movements, or even USB serial output. Infrared is our favorite wireless protocol - no antennas, certifications, pairings, passwords, or special tools required. Works everywhere in the world and very intuitive - everyone's got an IR remote in their home! Our original IRkey was a small USB-pluggable microcontroller board with an IR receiver, an Attiny85 microcontroller and indicator LED. When certain remote control commands were received, the IRkey would send corresponding keyboard presses. It was great, but was not easy to customize - you had to use the remote we sold it work. When you plug it in, the pIRkey shows up as a triple device: USB disk drive to store code, USB serial for debugging and Python interactive command line, and USB keyboard/mouse that can transmit keypresses or mouse movements. 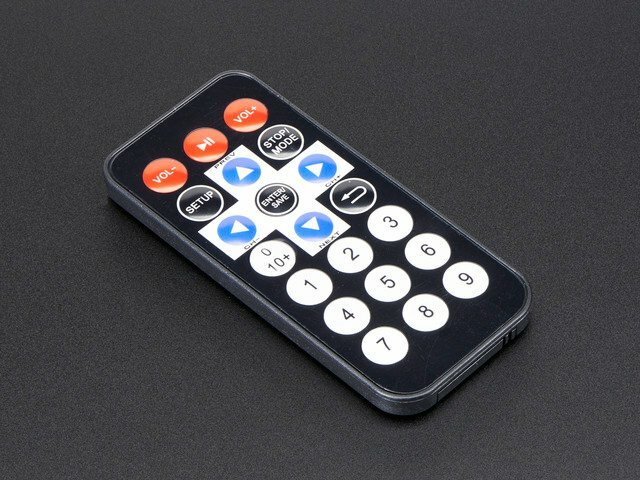 By default we ship with some very simple example code to read NEC remotes but you can use any remote that has about 38KHz output frequency which is 99% of remote controls. Here's some ideas: you could use pIRkey to remotely start/stop a program, shut down a computer, control a smart phone or tablet mounted far away, make adaptive controls, etc. This guide was first published on May 23, 2018. It was last updated on May 23, 2018. This page (Overview) was last updated on Apr 18, 2019.